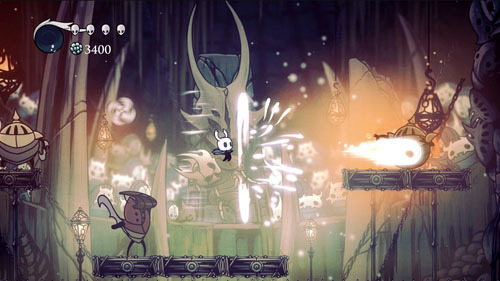 A game by Team Cherry for PC, Mac, Switch, PS4, and Xbox One, originally released in 2017, with the Voidheart Edition released in 2018. 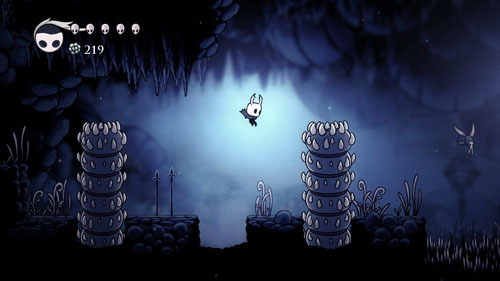 Hollow Knight is a metroidvania that offers a vast subterranean landscape to explore, filled with mysteries, powerful enemies, and deadly traps, presented with an atmospheric soundtrack and a dark but bold art style. The player is given very little information about the world as he sets out on his quest, armed with only a nail. Leaving the town of Dirtmouth, he enters a deep well with paths branching off to the left and right, with a large area immediately accessible and no map to track his progress. This lack of direction is core to the design of the game, which offers a deliberately-paced experience in a dangerous and unknown land. While there are several NPC’s to interact with and etched monoliths to uncover, these offer a narrow window into the game’s minimal underlying narrative, essentially leaving the player on his own in terms of where to go next. 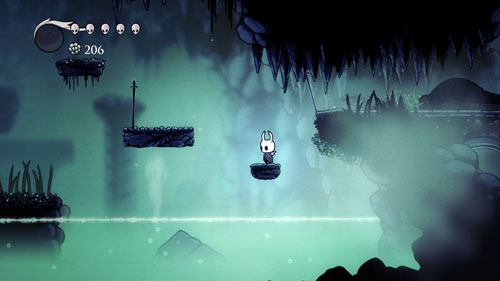 The game’s map system further emphasizes this, as newly-discovered regions offer no map of the surrounding area, and the world is not auto-mapped as the player moves through the environment, which is otherwise traditional of the genre. Instead, the player must search through unmapped regions to discover a cartographer who offers to sell a map of the area, after which the player can record his progress… but only if he has purchased a pen from the cartographer’s wife, and the map is only updated at save points. 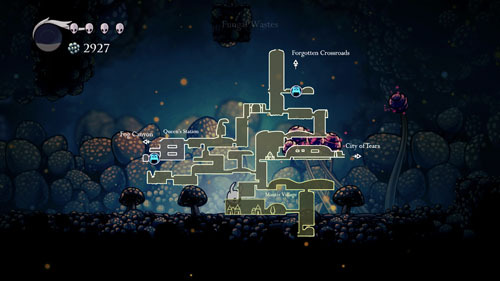 Additionally, the player’s position on the map can only be seen if the player has purchased a compass, and the compass takes up a sizeable portion of the player’s starting inventory space, preventing him from equipping other passive buffs. Adding multiple layers of complexity to the simple act of mapping not only slows the pace of the adventure but also adds an element of danger and mystery, as players can’t be sure where any given path leads or how they’ll be able make their way back to the surface. In addition, save points are few and far between, and getting killed causes the player to lose all of his currency. Caches of currency are permanently removed from the game world once they have been discovered, and most basic enemies only drop a small amount, so it can take a long time to rebuild a lost stockpile. Currency may be regained after respawning by fighting a spirit of your former self on the spot where you perished, but getting killed a second time (or dying before reaching the spirit) causes you to lose your money permanently. This can be a major setback for players saving up to buy an expensive item in the shop, and in the early going, it can prevent players from being able to afford basic mapping tools. 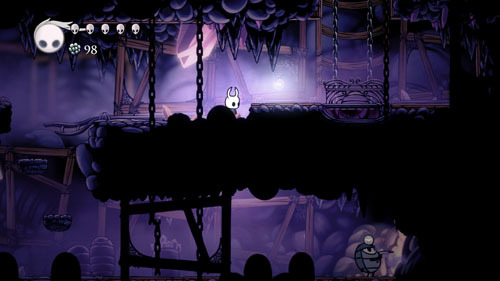 At the start of the game, the player has five units of health as well as a secondary energy meter which is represented by a glass bulb filled with white liquid. By holding a button for a couple of seconds, this liquid can be drained in order to restore health, and a full bulb can restore up to three units of health. The player can heal at any time, although he leaves himself vulnerable to attack while doing so, making the act especially risky during boss encounters. Getting killed causes the bulb to break, only allowing you to hold enough fluid to restore two units of health, but the break is repaired upon defeating your spirit self, or you can buy a fix at the local shop for a high price. 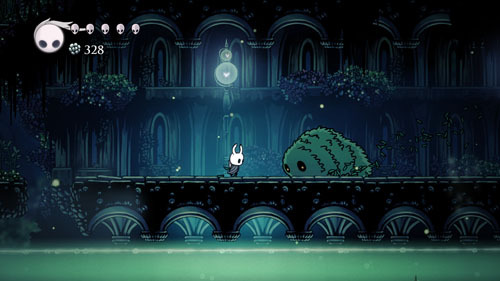 Fluid is added to the bulb by striking enemies, whether they are killed or not. 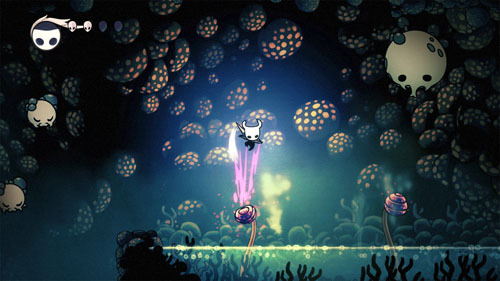 This system offers a great deal of give-and-take as the player explores wide areas between save points and occasionally faces off against powerful miniboss-class enemies without warning. 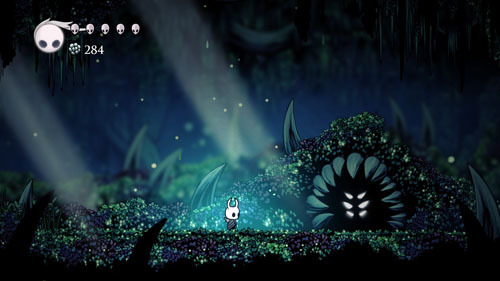 At any point, the player can be on his last leg and far from the safety of a save point, but rather than limping back to a safe area, the player is encouraged to go on the offensive and fight enemies in order to get back a sliver of health, knowing that a single mistake could also spell his demise. As such, the player is in constant danger, but also holds the key to extracting himself from said danger… as long as his fighting skills are as sharp as his nail. This also adds balance to boss encounters, as the player may find his health worn down, but paying attention to boss' telegraphs may open the opportunity to get in a few strikes or to run off into a corner to quickly restore a unit of health before the boss’ next attack. 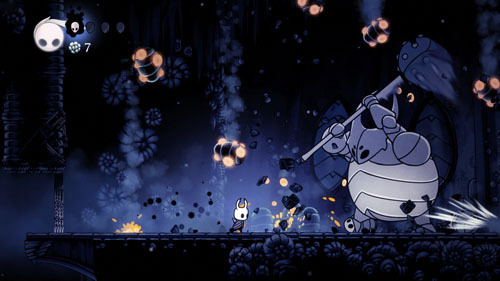 Enemies come in a number of shapes and sizes, with dozens of unique enemy types taking the form of various sorts of bugs. Each enemy type has a different set of behaviors, requiring that the player keep a keen eye to discern which enemies can be smashed with abandon, and which will dash toward him or let loose a barrage of retaliatory strikes. For instance, there are several varieties of beetle in the opening areas; round ones simply toddle toward you, but rhinoceros beetles actively charge when provoked. Some flying enemies with globular sacs will fire goo at you, while others can spawn smaller enemies that chase you down… and they spawn more when killed. Some mosquitos simply hover about, while others will wind up an attack and dash straight toward you. The stark high definition visuals allow players to quickly determine the appropriate strategies and deal with multiple enemy types simultaneously. 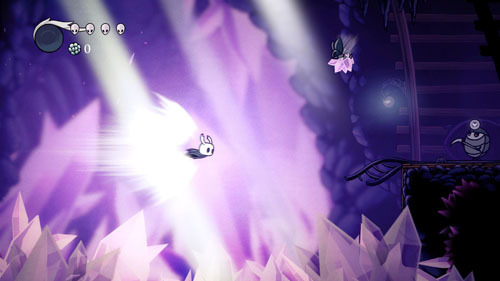 The player is fairly mobile and has a 3x variable jump, but his attack range is low, requiring that he move in close to enemies in order to destroy them, thus putting himself at risk. 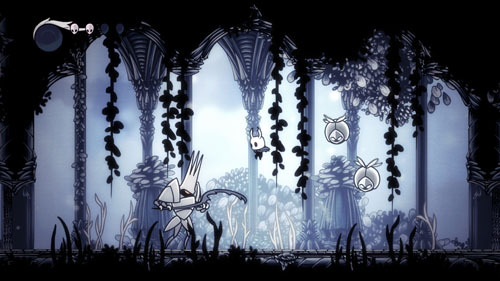 Smaller flying enemies can be tough to reach, even given the player’s ability to swing his nail in four directions and to bounce upward when striking enemies beneath him. 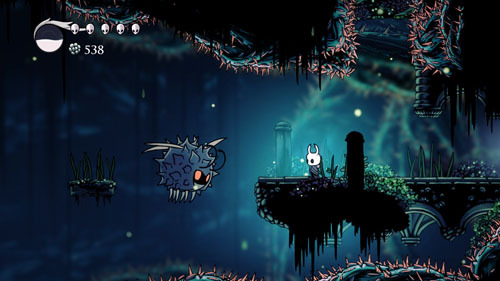 Many areas have pits of spikes or boiling acid that cause additional damage if the player misses his intended target. Furthermore, landing an attack on an enemy pushes it back as well as the player, so extra care must be taken when fighting on narrow platforms. There are numerous bosses and minibosses that require loads of hits to destroy and careful attention to attack patterns. Some of these enemies are hulking brutes that have heavy and/or ranged attacks, while others can zip around the environment quickly, requiring the player to stay on the move and deliver hits during narrow windows of opportunity. Many armored enemies can defend against the player’s strikes, requiring that he fight strategically to lure them into exposing their weak points for a moment. 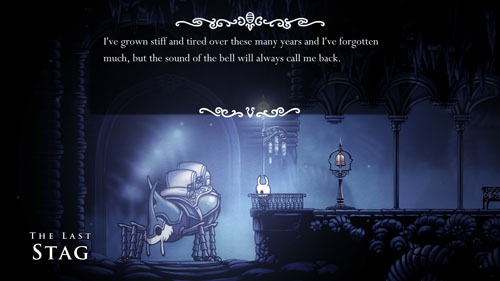 Per metroidvania conventions, the player slowly unlocks new abilities throughout the course of his adventure which allow him to access new areas – although the basic map system often makes it difficult to tell where he needs to go to take advantage of these abilities – leading to a lot of aimless wandering as the player backtracks through the vast landscape looking for the next route forward. This is alleviated somewhat by a fast travel system that lets the player move instantly between themed regions by riding on the back of a giant stag beetle. Among the new abilities gained by the player are a ranged magic attack that drains from the player’s secondary meter, a double jump and an air dash that let the player leap across wide gaps, and a wall jump and wall slide that allow the player to climb vertical surfaces. Many of these abilities are not only useful in combat and environmental navigation, but can also be used to uncover the game’s many secrets. 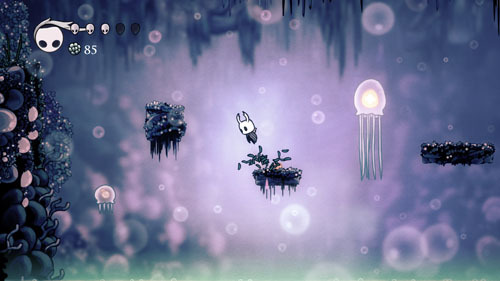 Throughout the game world are numerous false walls, out-of-the-way rooms, and optional miniboss encounters leading to caches of currency, the occasional imprisoned grub (which return to their egg room upon rescue), or charms that grant the player a number of passive buffs. Each charm takes up a certain number of inventory slots, requiring the player to consider which abilities will benefit him the most, especially given that charms can only be swapped at save points. There are dozens of charms to discover or purchase, and the player can increase his carrying capacity to equip more charms simultaneously. Buffs include a longer recovery time after taking damage, protection while healing, and a damaging dash enhancement. While many metroidvanias feature subterranean exploration with ancient machinery and architecture, Hollow Knights sets itself apart with its bold dark visuals, environments built around insects, the presence of wrought iron fixtures, benches that act as save points, and various Victorian mechanisms. 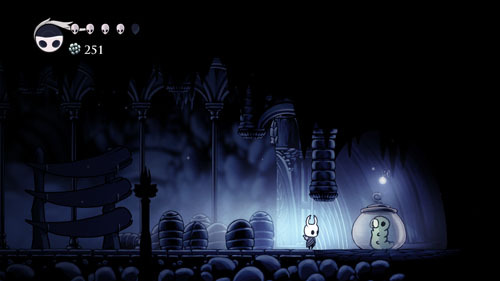 Doorways are made up of carapaces, foreground and background elements are comprised of twisted shells which appear even in areas with thick undergrowth, and there are numerous destructible objects in the background that appear to be lifeless bug parts. 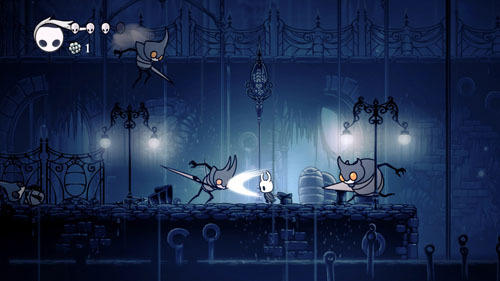 Hollow Knight was developed by Team Cherry, a studio based in Adelaide, South Australia, with design by William Pellen, technical direction by David Kazi, and art and animation by Ari Gibson. The game’s soundtrack was composed by Christopher Larkin. The game originally got its start as a Ludum Dare 29 entry with a theme of “beneath the surface”, and was later developed into a full-fledged game. The game was funded in part by a successful Kickstarter campaign.